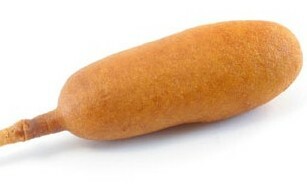 This is recipe is for the corn dogs served at Disneyland theme parks. It is freely shared for the asking at all Disney parks. Mix corn meal with flour, sugar, baking powder and salt. Add egg and milk; blend in melted shortening. Mix well. Skewer frankfurters and dip in batter. Stand skewer-side up and fry in deep-fat fryer at 350*F (175*C) until golden brown, about 2 or 3 minutes. Drain on paper towels and serve hot.